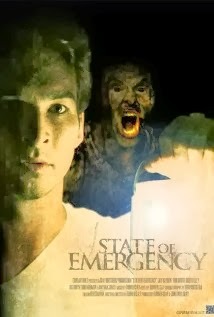 Tonight's movie was State of Emergency. It wasn't the worst movie I have ever seen, but I would say it is the most forgettable. Even while watching it, it was bland enough that you could forget what happened. Luckily the movie is very slow so it was hard to get lost. Netflix for some reason thought I would give this one a 4/5, but it is a case of where I should have checked Rotten Tomatoes first. It has an amazing low score of 23% there. The story is that a chemical plant explodes in a small town and the people around it soon turn into zombies. The zombies had multiple oddities compared to others. They would pretty much just stand around for some reason. They stood around so much that the characters actually made a map of the zombies. In what other zombie movie would it ever be possible to walk around the building a create a map of where all of the zombies are standing? The other thing that was unique about this movie is that the zombies could only appear on the screen, one at a time. I don't think there was a single scene during the whole movie where 2 zombies were shown at the same time. I can only imagine that it was a cost restraint, but it was so obvious that it make the movie feel a little off. It also didn't help that the characters were not that interesting at all. The dialog felt really forced and while watching it, we kept trying to imagine anyone talking like that in real life. I really couldn't tell if it was the director, writer, or the actors that caused the problem. After seeing the credits, the most likely candidate was clear. Clay Turner was the writer, director, producer, and editor. Knowing that it was one guy who pretty much did everything actually raised my opinion of this movie a little bit, although not by much. I am hovering somewhere between a 2 and 3 out of 5. Time for a zombie review I guess. Not sure what to say about these ones. They were somewhat resistant to pain. They could almost carry on a conversation, but in a really creepy way. They appeared to want to eat people, but they were not very successful at it. It wasn't clear if they were contagious or even how far it spread. All we know is that the army was able to easily wipe them out and control the problem. - Destruction: Headshot is effective, but might not be required. We have about a week left if our month of zombies. Check back tomorrow for another #undeadOctober movie review!